HARNAD: Let me just ask a question which everyone else who has been faithfully attending these sessions is surely burning to ask: If some rules you have described constitute universal constraints on all languages, yet they are not learned, nor are they somehow logically necessary a priori, how did language get that way? ---- CHOMSKY: Well, it seems to me that would be like asking the question how does the heart get that way? I mean we don't learn to have a heart, we don't learn to have arms rather than wings. What is interesting to me is that the question should be asked. It seems to be a natural question, everyone asks it. And we should ask, why people ask it. Harnad, Stevan (1976) Induction, evolution and accountability. Harnad, S, Steklis, H.D. and Lancaster, J.B. (eds.) 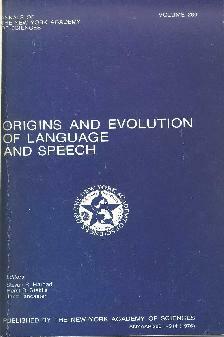 In Origins and Evolution of Language andSpeech. Annals of the New York Academy of Sciences. 58 - 60 .